I’m not really sure of the proper way to introduce a Quentin Tarantino film -- especially DJANGO UNCHAINED! Needless to say, you Tarantino fanboys won’t be disappointed. He’s back with the same political look at America that can be found in INGLORIOUS BASTERDS, only this time it hits a little closer to home. 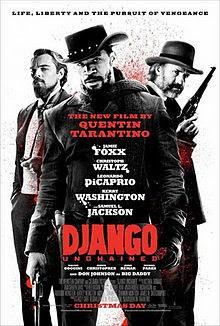 The story revolves around the slave Django Freeman (Jamie Foxx) who was taken in by Dr. King Schultz (Christoph Waltz). Schultz, a German bounty hunter, teaches Django the bounty hunting ways and gives him his freedom. They form an unlikely but deadly duo and ultimately develop a strong bond. Django was separated from his wife, Broomhilda (Kerry Washington), during his time as a slave and plans on finding her and buying her freedom. Schultz decides to help Django and thus they encounter Mr. Calvin Candie (Leonardo DiCaprio), a rather pretentious southern slave owner. A Tarantino film wouldn’t feel the same without the famously stylized, over the top violence. And DJANGO UNCHAINED isn’t lacking in the slightest. In fact, it may be the most violent of all his films. Along with the violence, DJANGO isn’t lacking in music or Tarantino-esque humor either. The soundtrack is absolutely amazing and compliments the film in a way only a Tarantino film would. As with all of Tarantino’s films, you will find yourself laughing at rather violent and serious matters. But, he makes it okay and thus DJANGO UNCHAINED deals with serious issues but doesn’t allow the film to be bogged down with melancholic chastising. Shows Tarantino is on winning creative streak, able to engage viewers with a sharply honed script while authentically presenting unpleasant episodes from American history.